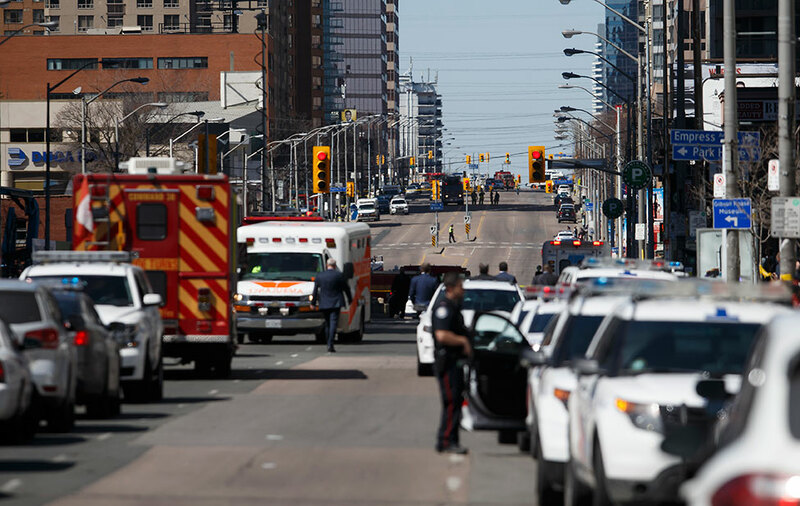 Last Monday at around 1:30 PM, a 25-year-old man, Alek Minassian from the suburb of Richmond Hill in Toronto, used a white Ryder Truck Rental van to mow down 10 people and severely injure 15 more. The vehicle drove for 2 kilometers before being stopped on the sidewalk. According to witnesses, Minassian drove onto sidewalks and began indiscriminately running into people. Everyone in his path was a target. The perpetrator was arrested less than 30 minutes after committing his horrendous massacre. The police later charged him, laying 10 first-degree murder charges and 13 attempted murder charges. As we have seen with similar tragedies, there were conflicting descriptions of the attacker in the immediate aftermath, before we learned his identity. Instant online debates and discussions started, with guesses about the perpetrator’s motive, race, religion, ethnicity, and background. Those who think Islam and Muslims are a threat to society were quick to call it terrorism and blame it on Muslims. Even worse, some “crazies” and social media commentators did not hesitate to jump to conclusions and use the incident to enforce hateful ideologies. While the Muslim community and people of color held their breath, these commentators rushed to blame Justin Trudeau, Canada’s immigration policies and Muslims. Even some reporters were not cautious in covering the incident. For instance, CBC reporter Natasha Fatah was quick to tweet: “#BREAKING Witness to truck ramming into pedestrians tells local Toronto TV station that the driver looked wide-eyed, angry and Middle Eastern.” Her tweet was retweeted more than 1,500 times. Only a few hours later, the Globe And Mail reported that the attacker had “no known religious or political affiliations or strong views on anything”. Indeed, once the identity of the perpetrator was revealed, the narrative changed from blaming Islamic terrorism to discussions about mental illness. Again and again, the public and media response show how collective culpability is mostly applied to perceived Muslims when the perpetrator has an Arabic name. Critics emphasized that non-Muslim attackers are usually humanized in a way that no Muslim or person of color perpetrator ever would be. “Incels” – short for “involuntarily celibate – are a misogynistic community that blames their misery, sexual inactivity, and lack of romantic relationships on women. They are part of the broader active and online platforms linked to the alt-right and “manosphere” ideological stance – sexist, xenophobic, racist, nationalistic, identitarian, and so on. Elliott Rodger is in turn the infamous U.S. mass murderer who killed six people in California in 2014 in an act of revenge for being rejected by women. After finding out about this Facebook post, terrorism expert J.M Berger stated in a Tweet that the attack is “clearly terrorism, and it really isn’t even a close call”. For his part, terrorism scholar Amarnath Amarasingam stated in a Tweet that the belief that “only brown people get charged with terrorism” is false, demonstrably wrong, and it does not contribute anything to the debate about terrorism. The aim should be to restrict the use of the word “terrorist,” not expand it, Amarasingam added. The real issue is not whether a perpetrator is brown or Muslim, or whether an incident is, or should be, categorized as terrorism or not. It is instead about how these kinds of attacks are constantly used to demonize others and spread hate and racism against a whole community. Terrorism is a complex issue where one must look into intent based on political or religious motivations. We know that it is not up to the public to decide the nature of violent attacks, but the public’s reactions do not form in a vacuum. They are socially constructed via what they are being fed from social media, news outlets, and public figures. Canada is a multicultural society that derives its strength from its diversity and openness towards minorities, refugees, and asylum seekers. Our politicians and responsible media men and women should be wise and cautious while tackling such sensitive issues. They should get their facts straight and avoid rumors before tarnishing innocent communities.